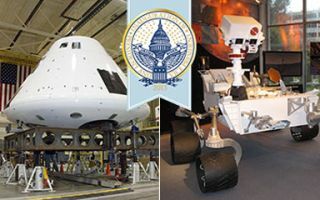 Full-sized models of the Orion spacecraft and the Mars Curiosity Rover will be on display during the inaugural parade (Jan. 21). When President Barack Obama takes his oath of office to begin his second term Monday, NASA will be there. NASA's famed "Mohawk Guy" Bobak Ferdowsi will march in the Presidential Inaugural Parade on Monday (Jan. 21) along with life-size replicas of the space agency's Mars rover Curiosity and Orion space capsule. Bobak Ferdowski, a flight controller for NASA's Curiosity Mars rover, recently updated his famous mohawk hairdo to include the Morse Code letters for "JPL" in homage to NASA's Jet Propulsion Laboratory in California, where he works. These Morse Code symbols are also emblazoned on the Curiosity rover's wheels to help researchers track the rover's speed by the indentations it leaves in Martian dirt. Ferdowsi is a flight director at NASA's Jet Propulsion Laboratory whose unique hairdo catapulted him to Internet fame after the spectacular Mars rover Curiosity landing last year. "The things we do, the exploration we do, is not just about learning about other planets. It's about understanding our own. NASA gives us a chance to travel outside our world as a way to look back and learn about ourselves as a species — as people. There's nowhere else in the world where you get to do that," Ferdowsi said in a statement. Ferdowsi is reportedly trading in his mohawk locks for a new hairdo in honor of the President's inauguration. According to an interview with Wired, Ferdowsi is keeping details of the new hairstyle under wraps until the inaugural parade. NASA's Orion deep-space capsule — the agency's first new spaceship designed by NASA since the space shuttle in the 1970s — is designed to send humans farther into space than ever before. The space agency hopes the capsule will be the vessel for manned missions to asteroids, the moon and even Mars. NASA is hosting an open house for the agency’s social media participants today (Jan. 18) in honor of the inauguration as well. The open house is available to the public without a reservation, but 75 specially chosen guests will get a “reserved seat” that gives them special access to various events throughout the day. The open house will also include panel discussions with NASA astronauts and displays showing off some of the agency’s accomplishments. Telescopes will be set up outside the David M. Brown Planetarium in Arlington, Va., for a "Star Party" tomorrow (Jan. 19). Experts with NASA will speak about the future of space exploration and missions the agency already has in the works. For NASA's full schedule of Inaugural Weekend events, click here. This story was updated today at 4:10 p.m. ET.